Driving long distances is a guilty pleasure of mine, right up there with cycling and running long distances — I just love covering ground. The best part about road trips is breaking up the drive with some sort of hurried adventure in a new-to-me place. The potential discoveries are seemingly endless. 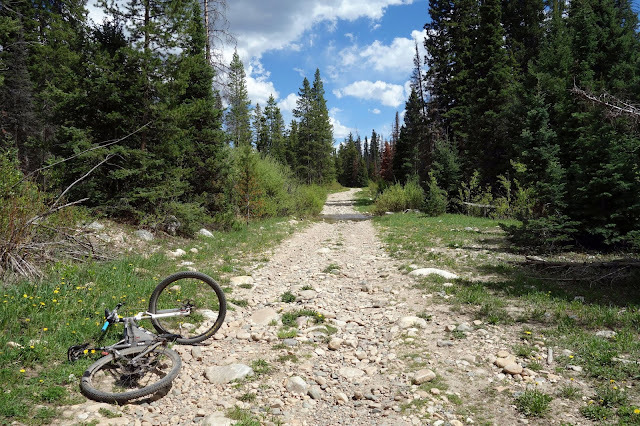 Driving from Salt Lake City to Boulder on Monday, I planned to take I-80 and check out singletrack trails in Laramie, which are popular with Colorado mountain bikers and must be for a reason. However, an afternoon ride through Corner Canyon on Sunday resulted in increased pain in my bruised elbow. I had to concede that I wasn't going to feel good on even remotely technical trail. 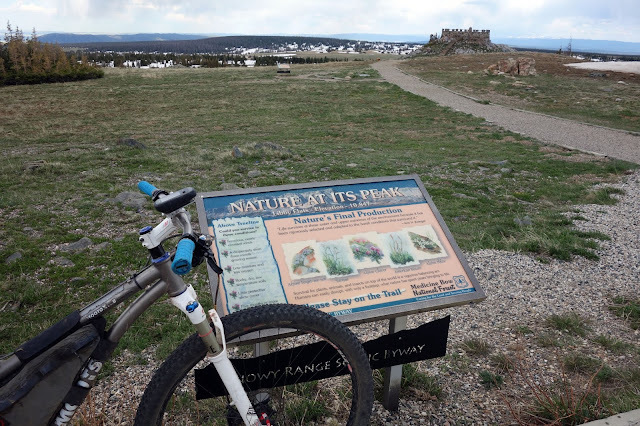 So I shifted my focus to national forest lands just south of I-80 and west of Laramie, in the Snowy Range. I figured I could find some scenic jeep roads to ride. But after two miles of jack-hammering on rocky gravel, my elbow was giving me fits. I did not need this aggravation, so I turned around and gritted my teeth through a painful descent. Good decision to quit early. Since I'd already driven 30 miles off route and kitted up, I didn't want to waste the opportunity to ride. The smooth pavement of highway 130 seemed like a soothing alternative for my sore arm. I was five or six miles into the road climb when the scenery began to look eerily familiar. This mountain village ... this roadside fishing platform ... those bald peaks in the distance. Where I have seen this before? 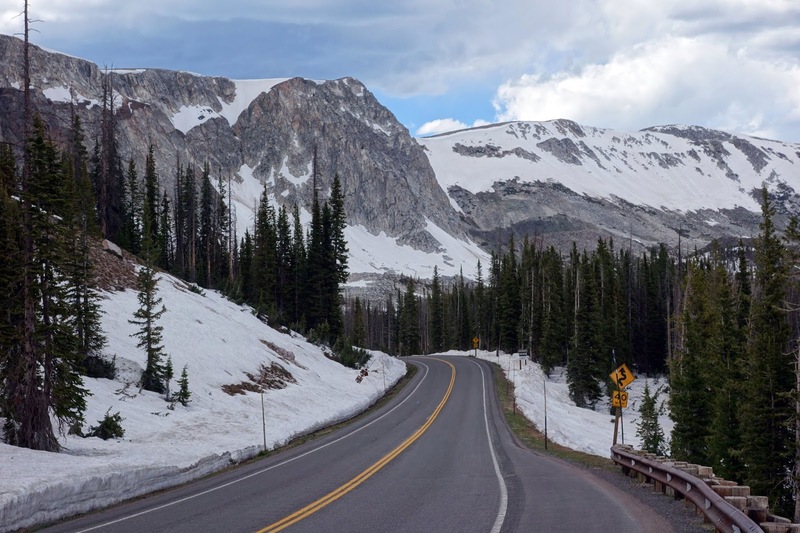 It took about that long to realize, "Oh, this is the high pass we crossed in Wyoming during the cross-country bike tour!" This was 15 years ago, the last time I pedaled this road. Details have eroded to the point that I didn't recall the location or even the name of the mountain range, but the images of that day are still burned in memory, as clear as anything. Anyway, this was to be a long tour, so I brought the kitchen sink. Among the contents of those panniers was a huge circa-2000 laptop computer and a full-sized frying pan (because camp pots don't work as well when cooking for two.) Also, non-foldable spare tire! I never weighed the loaded bike, but always guessed it to be in the range of 70-80 pounds. Starting the tour with limited training and experience, then pedaling that beast for an average of 50 miles a day for 65 days, left me with knee issues that persisted through my 20s. I also sustained at least 30 flat tires during that trip ... usually pinch flats. I could never figure that one out. 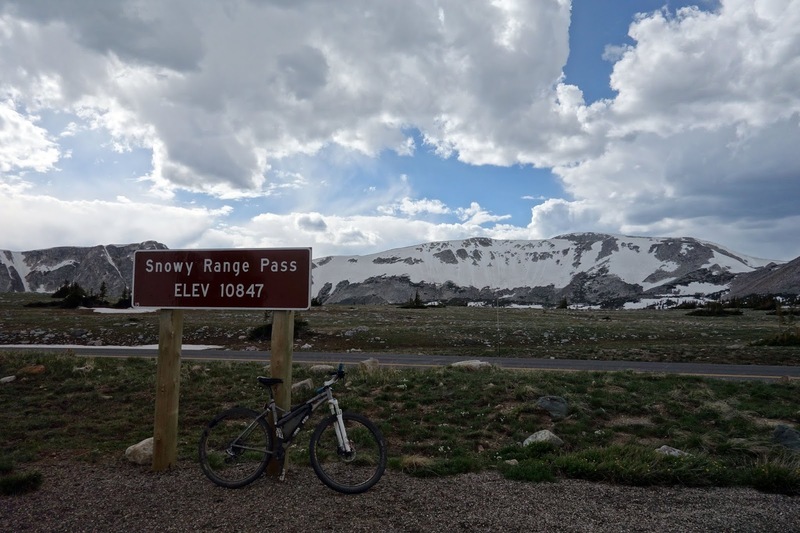 "We crossed the Continental Divide at 10,000 feet and the Snowy Range at nearly 11,000 feet. 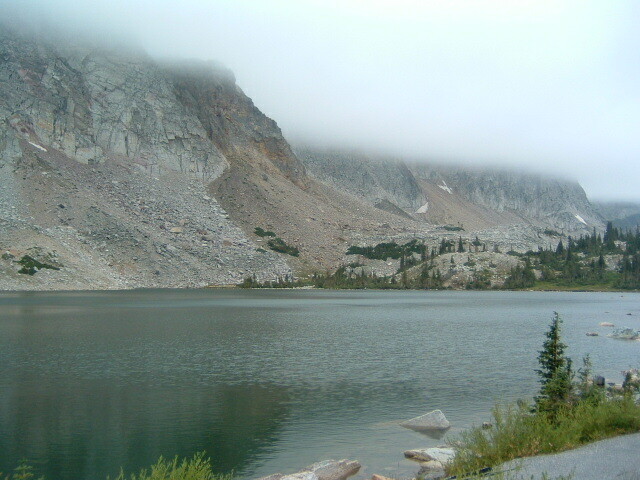 The morning we climbed the Snowy Range, southeastern Wyoming had dropped to record low temperatures. As we climbed into the clouds, the air hovered just above freezing and stinging rain pelted our skin. We rounded a small lake at 10,200 feet and proceeded to roll across the eight-mile summit beside 12,000 foot peaks of jagged granite, glacial black lakes and windswept pine. It was spectacular, but harder to see as the fog thickened and the temperature dropped. We reached Libby Flats, the pass, just before 11 a.m. at 10,857 feet. At this point we had put on every piece of warm clothing we had, and still the cold wind cut through. Despite the rewards of climbing to the top of the world, the swift ride down to Centennial proved to be even more excruciating than the climb. The continuous 7 percent grade was merciless on my bike's burning brakes, and my meager coat and gloves proved useless against the windchill. Every part of my body went numb; my face froze in an expression of terror, and I screamed down the mountain until my knees buckled and my fingers turned gray. Centennial, at only 8,100 feet, was a welcome sight, and we ducked into a tavern for a warm lunch and hot chocolate. 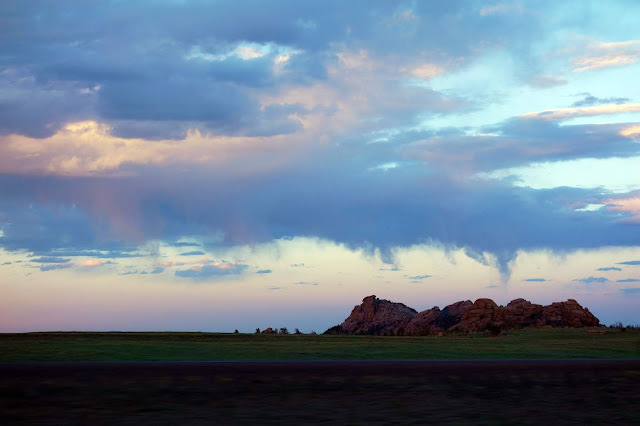 From there, the flat high plains rolled us into Laramie - though not without a fight. We fought a prevailing 20 mph crosswind out of the southeast with no relief. By the time we reached the small city, the storm we had been running from all day caught up to us - and it poured. To compound things we got lost looking for a place to stay - impossible on a holiday weekend - and I lost a rear pulley which took over an hour to find and replace. It was nearly dark before we rolled into a KOA campground and crashed in frustration and exhaustion as the rain pounded down." 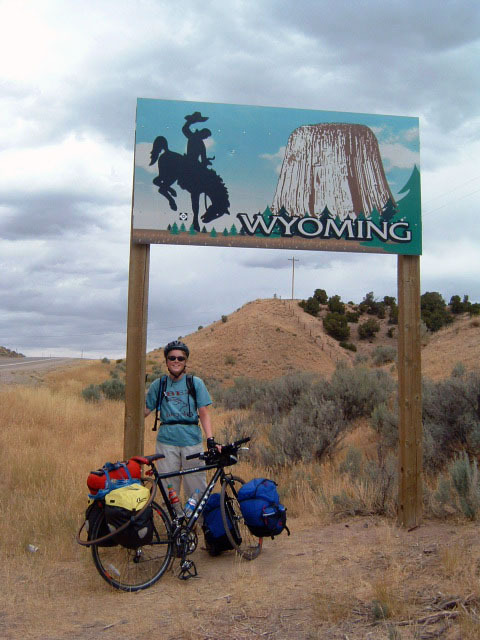 "The thought though that people would actually ride their bike over the immense mountains of the American West didn’t enter my mind until the first time I saw someone doing it. 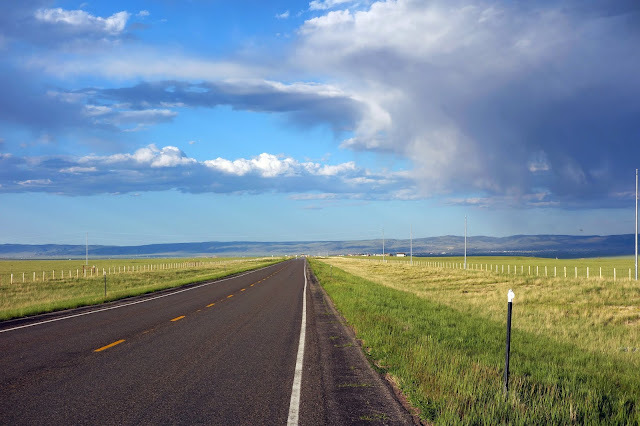 As I recall I was in New Mexico, crossing through the southern Rockies in the ease of my Volkswagen when I saw a lone rider chugging up a winding mountain road. At the time he was probably only 3 or 4 miles from the top, but in my mind he seemed so much further than that. Driving past this rider, I imagined it taking him not minutes or even hours, but rather days to climb this last few miles. 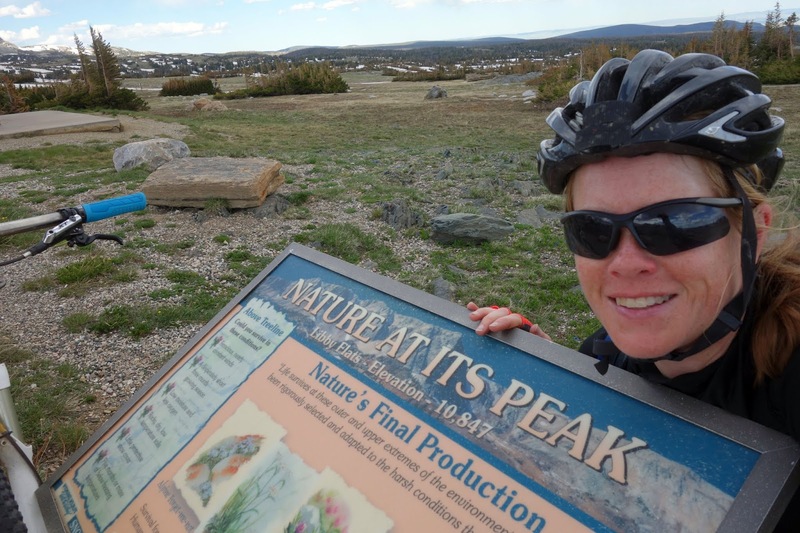 At that time the task of biking, fully loaded with gear, up and over the Rocky Mountains seemed as challenging and as intense as most anything I could imagine. ... Several days later I still find myself thinking occasionally of that first rider I saw biking over the mountains in New Mexico several years ago. I coasted down from the mountains and out across the prairie having accomplished for myself what seemed to me several years ago like a nearly impossible feat. The wind here on the plains is mostly at our back and the terrain is always dropping more than rising, but even a larger factor in making these past 150 miles seem so comfortable has been the gratification and momentum we gained by biking up and over the Rocky Mountains, an experience which for me will likely be one of the most memorable things I’ve ever done." Fifteen years later, the climb is not nearly so daunting, the feat more tame ... and yet the original experience is every bit as memorable. After about two and a half hours of mostly relaxed spinning on my mountain bike, I pulled up to the pass. The first thing I noticed was this sign, which I recognized so clearly that I was convinced I could take a selfie in the same position as the original photo (not quite, but ...) It's still exactly the same! Upon comparison with the original photo, I now see it's not exactly the same, and the differences are driving the typographer in me crazy. How did they squeeze in that "Nature's Final Production" line? None of the other text is squished. Removing the footprints from the bottom of the old sign doesn't add enough room for text that large. Everything else is the same. Arrrrgh! The views from Libby Flats. This is something I love most about Wyoming — high alpine plains. This more than anything else reminds me of the Tour Divide. That nostalgia trip also had apt timing, as the 2018 race kicks off Friday. 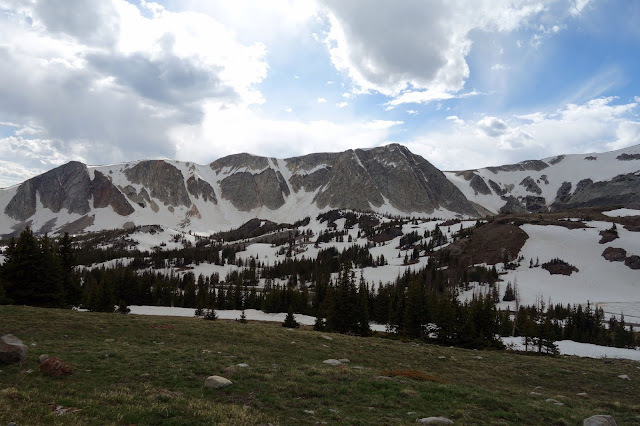 Medicine Bow peak. 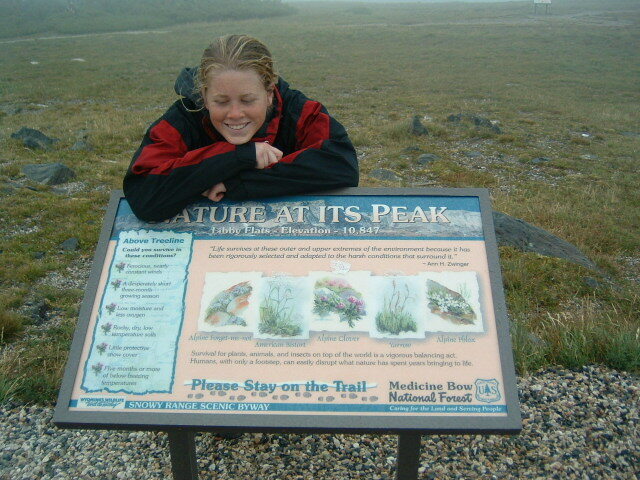 Similar to my first visit here, the weather deteriorated near the top. Temperatures dropped to the high 40s with gusts of wind and rain. The thunderstorms were short-lived, but I ended up descending all the way to the bottom of the pass wearing my puffy jacket. It was a quick trip and I was decidedly better equipped than I was in 2003, despite having about 50 pounds fewer supplies. Driving into Laramie with evening light. It was so beautiful. I was all kinds of stoked about planning another bike tour across the plains, until I stepped out of my car to take this photo, only to be attacked by dozens of mosquitos. Then I remembered the sand hills, and the stop-in-our-tracks Nebraska winds, the mean drivers of Missouri, the tornado warnings of Illinois, the vicious dogs of Kentucky, the endless rollers on 17 percent grades in Ohio, the cold October nights in Pennsylvania and New York ... little did we know coasting down this road into Laramie in 2003, our hardest days were still ahead of us. But it was blissful, at the time, to think it was all downhill from here. Life may be linear, but it folds in on itself in the most interesting ways. There's really nothing like experiencing something for the first time, but the nostalgia trips can be satisfying, too — both for the lucid memories they evoke, and the perspective into how far we've traveled since we first climbed this mountain. You have so many stories & I always enjoy reading them! I just realized we almost share a birthday! I am August 21! 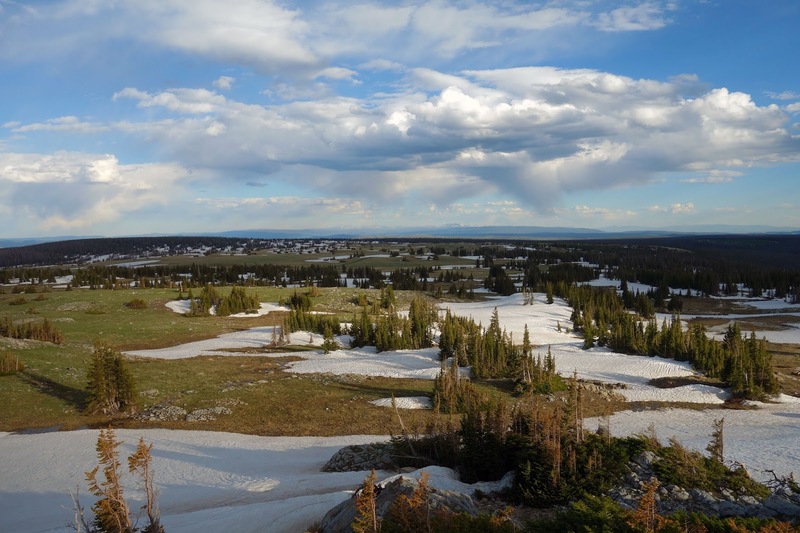 I love how the light colored rock of the Snowy Range looks from a distance, like some kind of white mirage on the horizon. That is such incredible country to be able to cycle in. Your words and photos take me there. It's on my one day list!